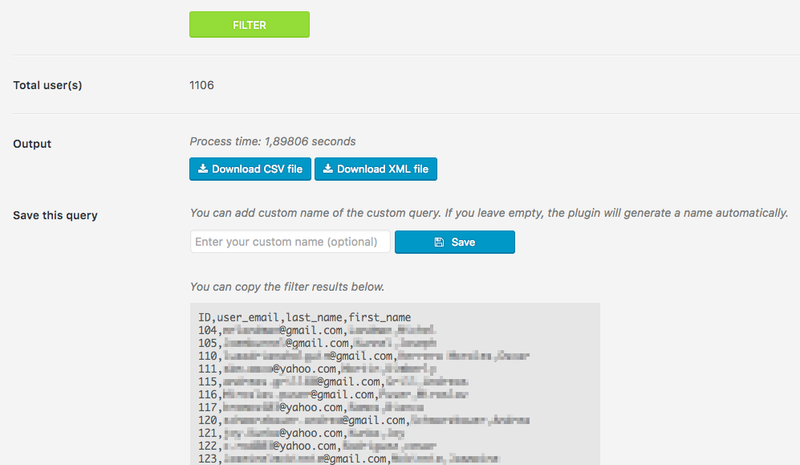 Export users in WordPress to CSV (Excel) or XML in a moment. This plugin allows users to export users of any type to an CSV or XML file with customizable filters. 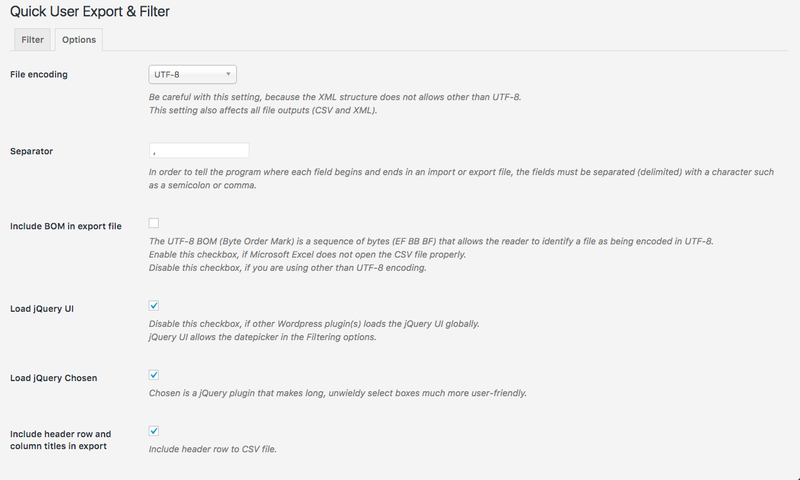 Quick User Export & Filter’s simple drag & drop interface makes it easy to export data from Users to an XML or CSV file. Customize the layout of the export file. Edit your data and export to CSV/XML in the twinkling of an eye. Quick User Export & Filter’s simple drag & drop interface makes it easy to export data from Users to an XML or CSV file. Your export file can be organized exactly how you need it to be with just the data you need. Quick User Export & Filter makes it possible to incredible fast export hundreds of thousands of records, even on shared hosting. Thanks to MySQL queries with ajax-driven technology, the Quick User Export & Filter export from any larger database to a file just a seconds. Need to edit your users in Excel? Export your data with Quick User Export & Filter, edit your data however you like. Thanks to pure MySQL queries the Quick User Export & Filter processing very fast. The average export time is only 1.7seconds! You can use optionally the jQuery Chosen and UI interface for exporting and filtering steps faster than anything before. 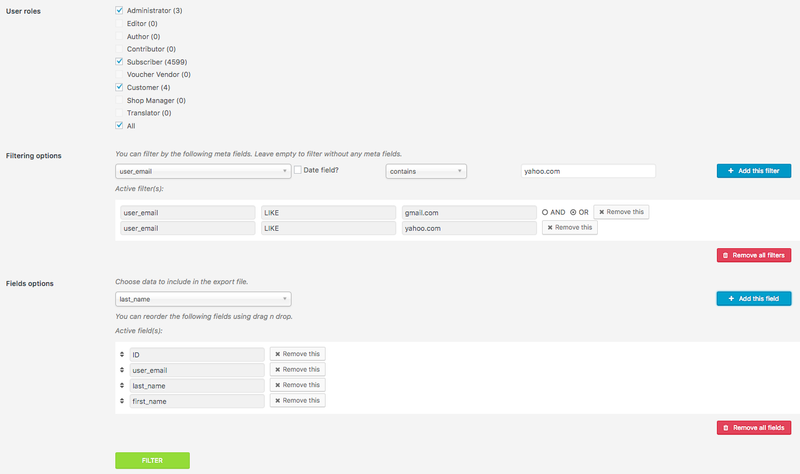 Choose the data you want to export using Quick User Export & Filter’s simple drag & drop interface. Instead of ending up with a messy export file with a lot of unnecessary fields, you can choose to only export the specific data that you actually need. Save your exported data as an XML or CSV file. Want to export all WooCommerce users who are registered before 2017? Want to export all of the users from your WooCommerce store? 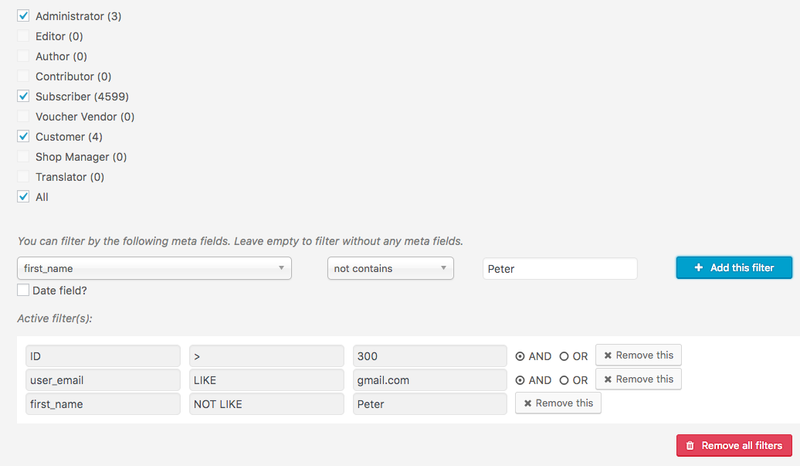 Want to export all users name who are called by Peter? Create easy to understand filtering rules with a simple, clean interface to get exactly the right data out of your WordPress site. You can use AND/OR relation to filter anything you want. Do you need your custom queried users later? Of course, you can save your custom queries to database and run this query anytime you want, in a moment. We are tested and it works with most versions of Wordpress, even of the older versions too (includes Wordpress version 3.1). You can translate this plugin to your language easily. All the language files are located inside the plugin /languages directory. The Quick User Export & Filter uses from different location of .mo/.po file, like wp-content/languages, so you don’t be afraid the future updates of plugin, because your translation is safe.